The QA iCON-3400BEW is a Web based Enabled and networkable 34-point BACnet AAC DDC controller for general purpose app-lications. The network port provides interface for Ethernet connectivity allowing the DDC to communicate with any BACnet-compliant Client. It provides built-in control func-tions, input pulse counting for digital inputs, runtime total-ization, time scheduling, on and off interlocking as well as on/off delays. 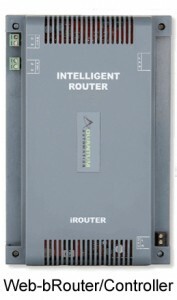 The bRouter serves to bridge an MS/TP network to a much wider Ethernet network. It utilizes the availability and scalability of Ethernet connectivity. Since most buildings (commercial, industrial or residential) are internet-ready nowadays, control networks employing BACnet protocol can be controlled and monitored locally or remotely via the internet/intranet infrastructure. Any BACnet-enabled device can be connected to the MS/TP network as long as the number of nodes or the maximum length of the communications cable is not exceeded. The BACnet Web Browser Router/Controller is a powerful embedded 32 bits Microprocessor running on 800 MHz real time clock. The router controller runs on an open based operating system, Linux. In the up stream, it supports IP BACnet allowing web access. 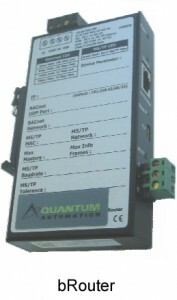 In the downstream, it supports BACnet MSTP and other protocols such as Q-Bus. The user allow accesses data in the router/controller network via any type of computer (desktop or laptop) that runs on standard Web Browser software.